the final product should be an animation. it will be an automatic camera record, like the real life nightshots in forests we know from animal documentaries. the setting: an expedition has discovered a planet with life potential. and it seems lifeforms are truely existent there. they are not developed as humans and seem to be shy. they live in caves due to high temperatures on the surface. anyhow they could be attracted by light. 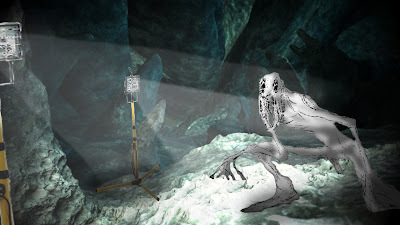 so the scientists installed sites inside the caves systems, that carry lightsources cameras and energycells to record footage of the unknown species. a very small story of a few seconds will give this shot some life. the first posts only carry props, landscape and the creature. i think this whole project will take not less than 2 or even 3 months cause of my job. for the chest i really have a hard time doing cool body topology, since i never modeled a creature. the first try you see in the WIP, titeled "ugliness" there i just tried to model a chest without any references...that was silly. then i thought the best would be to take references and trace them. ans since the creature will be real skinny i chose skeleton references from the net. i placed the shoulder blade over the rips and deleted the underlying rips. afterwards i closed all open topology. then i did the same with the shoulder and breastmuscle. i believe no charmodeler would ever model this complicated way, but for me characternoob it turns out useful.